we all must have cabin fever, and must be ready for a fantastic February meeting of the Fire Eaters!!!! Next week is February if you can believe it! The Edmund Ruffin Fire Eaters will meet this coming Wednesday, February 3, 2016 at Anna’s Italian Restaurant, 7009 Mechanicsville Turnpike, Mechanicsville, VA, in the shopping center across from Lee Davis High School. Join us at 6:00 p.m. for good food and good fellowship. Or come for the formal meeting at 7:00 p.m. This month our speaker really will be Sherry Graves, and she has an entertaining presentation prepared for us. 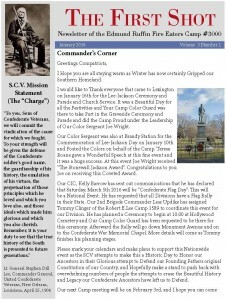 Let’s pack the meeting to also hear the accounts about the successes at Lexington for the Lee Jackson services and parade, from those camp members who were able to attend those important events. See y’all next Wednesday, February 3. BE THERE!!!! The January 2016 edition of The First Shot is now available. Download your copy here. The membership of the Edmund Ruffin Fire Eaters Camp # 3000 is pleased to announce their donation of $1000.00 to assist in the fight to save the Confederate Monuments in New Orleans. 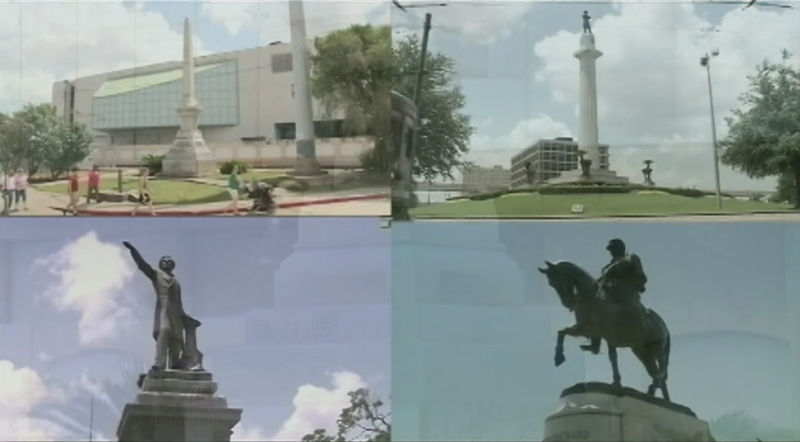 The City of New Orleans voted to remove the monuments from the city on a “nuisance complaint”. There has been a lawsuit filed to prevent the removal but these actions are very expensive. We all need to fight these attacks on our Southern Heritage. Make no mistake they will come for our statues on Monument Avenue if we do not win this battle.